NOTE TO MY READERS: I am going to try a format change. My very smart daughter, who is also a blogger and whose opinions I respect, suggested I try publishing shorter and/or different posts more often. 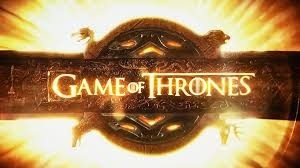 So I am going to try to publish my column on Tuesdays and my reviews on Thursday or Friday. I know I have some readers who particularly like my reviews and I was thinking they were getting lost at the end of my weekly column. So let me know what you think. Separate the reviews from the column or go back to the one long post per week that includes everything? Or separate the blog even more? There is something for everybody this week. Film lovers, book lovers, foodies and fashionistas! 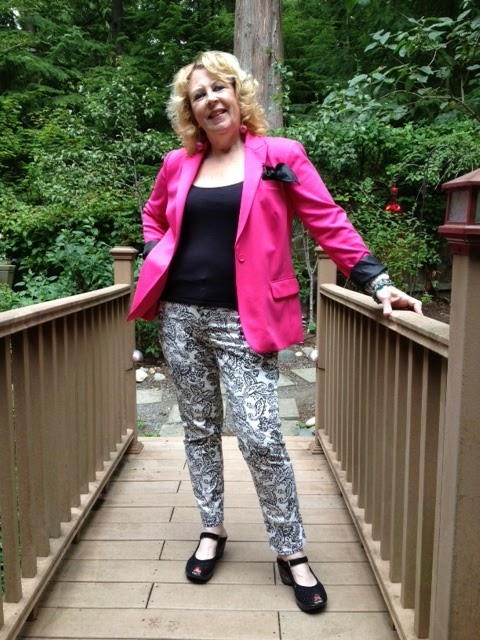 This week, in addition to my film and book reviews, it's all about one of the best food shows and the proper wardrobe for a Rock & Roll Wife! 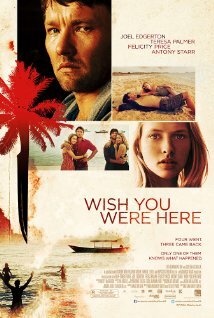 This Australian film follows two couples on a vacation to Cambodia where one of them goes missing. Beware of the friend whose line of work seems dodgy. Rosy the Reviewer says...really riveting drama and character study. 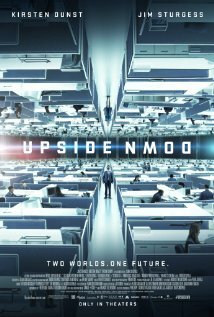 A small film that deserves to be seen. 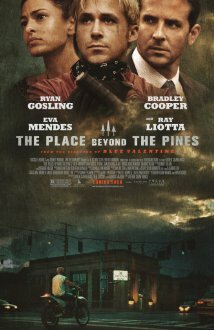 Ryan Gosling's intensity continues to amaze in this story of a trick motorcycle rider who starts robbing banks to support his family and what happens when he encounters a rookie cop. Lots of big names here. I'm not a huge Bradley Cooper fan. Not sure why. Rosy the Reviewer says...highly engrossing but falls apart a bit at the end. Still worth seeing and recommended. 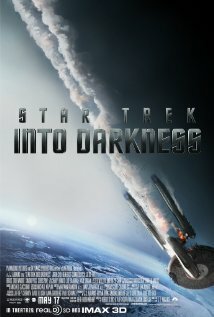 I so wanted to like this film because I had heard it was really good and I do like adventure sci-fi films. I will say that it was probably quite spectacular to look at on the big screen in 3D but the story just didn't cut it for me. Sometimes these big epics just get too convoluted. When I have to think "Huh?" through the whole thing, I am distracted. But there is homage paid to "The Wrath of Khan" and the character interactions are fun, if not sometimes silly. I will say Chris Pine as Capt. Kirk is a nice looking fellow er, good actor. 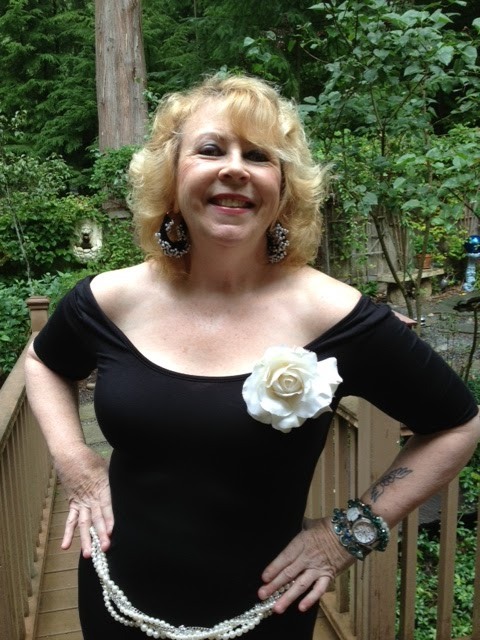 Rosy the Reviewer says...you will get the most impact seeing this on the big screen but Star Trek fans will enjoy. This is one of those films you will either love or hate. I loved it. It's a Romeo and Juliet tale about lovers who live in twinned worlds with gravities that pull in opposite directions. The cinematography and set design are works of art. I just wish Kirstin Dunst would get her teeth fixed. When she smiles, she looks like a character out of "The Simpsons." Oh, I know, that's mean. But as many people say after they have said something mean, "I can't help how I feel." Rosy the Reviewer says...those who like sci-fi, fantasy and love stories will enjoy despite some plot issues. A memoir that combines comedy and drama as a young Mormon woman tries to stay true to her religion and remain a virgin until she marries. Not an easy task when you are well into your 20's. Imagine. Rosy the Reviewer says...a quick read that sheds light on what it is to be a young, attractive single Mormon woman, though it's a bit of a one-trick pony. Will she or won't she? 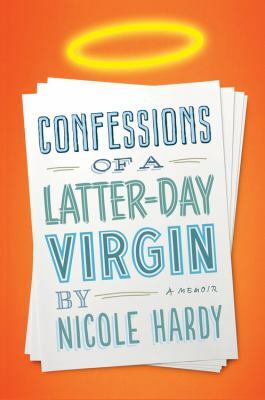 If you like humorous memoirs and are curious about the Mormon religion, you will enjoy this. If you are a foodie, you will love this British TV program, "Come Dine with Me." Four foodies get together each night in each other's homes to eat food prepared by one of the four. Then they score each other and the winner wins 1000 pound. In addition to watching the food created and the interaction of the guests, which has gotten more and more outrageous over time, the narrator, Dave Lamb, is cheeky and an absolute hoot. The show is available on YouTube. I wish they did a version here in the U.S. There was a rumor that they would but so far haven't seen it. Rosy the Reviewer says...a must for foodies and Anglophiles. But there is a program that airs in the U.S. in various cities called "Check Please," and yours truly got to be on it! We didn't cook for each other in each other's houses. We recommended our favorite restaurants and then anonymously dined there. Then we came together to talk about what we thought. So far I don't see that there is another season in the offing, but to show I am in good company, our own President Obama was in the Chicago version of the show (when he was a Senator). Check your local PBS station to see if you have this show, "Check Please," in your neck of the woods. If you are really a foodie, you will love it. It's a lot of fun. (Here is the main link for "Check Please Northwest" for other episodes). Rosy the Reviewer says...WE WANT MORE EPISODES OF CHECK PLEASE NORTHWEST!!! Now that Hubby is in a band again (did I tell you that's how we met? ), I have the added dilemma of looking the part of a proper Rock & Roll Wife. 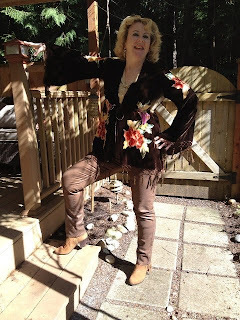 Do I fit myself out in full R & R regalia? or go for a more sophisticated approach? 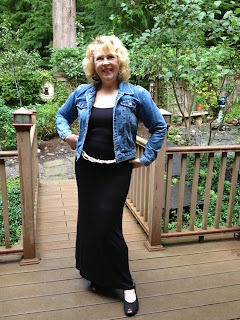 The LBD with touches of denim, bling and the requisite tattoos? or a more fashion forward approach? Rosy the Reviewer says...always go for the bling! 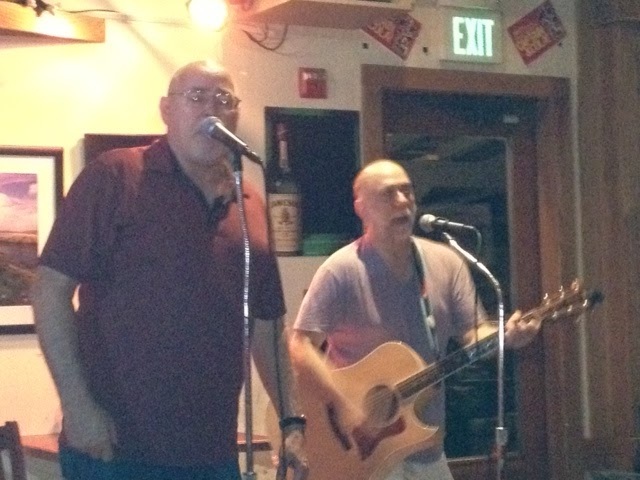 As I mentioned, Hubby plays in a band. 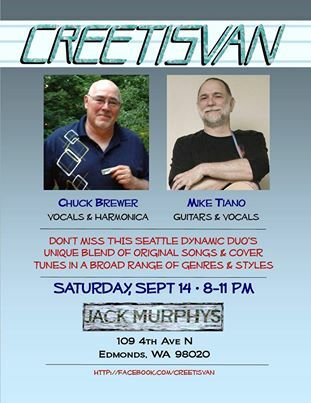 Their gig at Jack Murphy's last Saturday night was lots of fun. 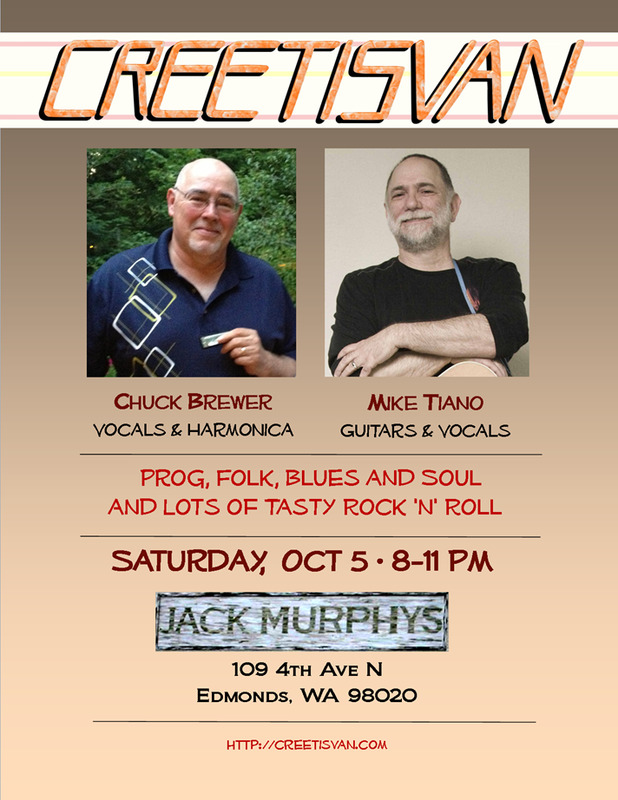 They will be appearing there again on October 5th so if you are in the Seattle area, join us! And feel free to wear your rock & roll finery. 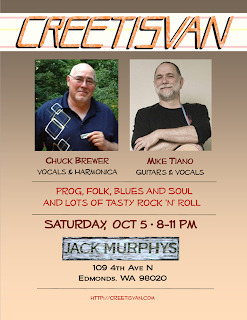 Rosy the Reviewer says...don't miss the singular singing sensation that is Chuck Brewer and the guitar stylings of Mike Tiano. Hope I gave you some ideas for the weekend. I wish you all great happiness! You look great in all of those outfits! Which one did you choose and, more importantly, did you have fun? Hi Juhli. 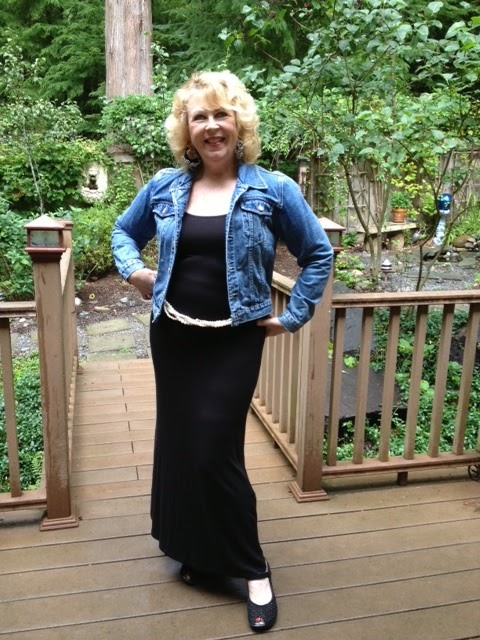 I went with the long black dress with the denim. And it was great! Retirement: Is the Honeymoon Over?